Between October 5 and 11, 2015, AMGA Certified Ski Guide and AMGA/IFMGA Aspirant Mountain Guide Christopher Marshall posted his photos and stories on our social media pages as part of our Alpinist Community project. We noticed Marshall's work when he started tagging us on Instagram. To tag Alpinist on social media, add this to your posts: #theclimbinglife, #alpinistmag, @alpinistmag. Marshall calls this collection of images "a reflection of the greater shared experience [captured] during dusk and dawn's golden hour." 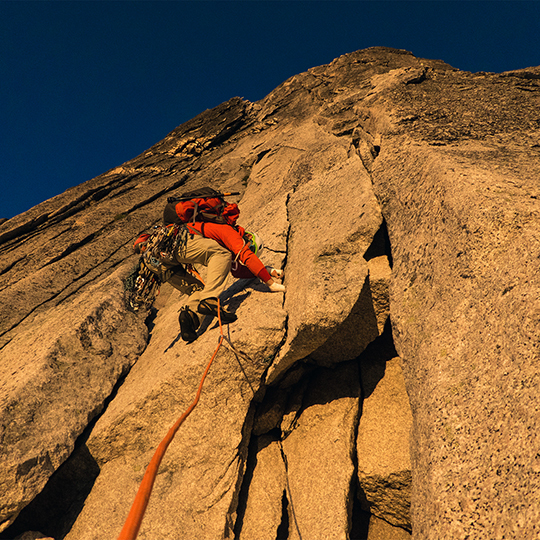 Ted Teegarden launches upward into a sea of golden granite on the Northeast Ridge of Bugaboo Spire (5.7, 450m, Sykes-Turner). 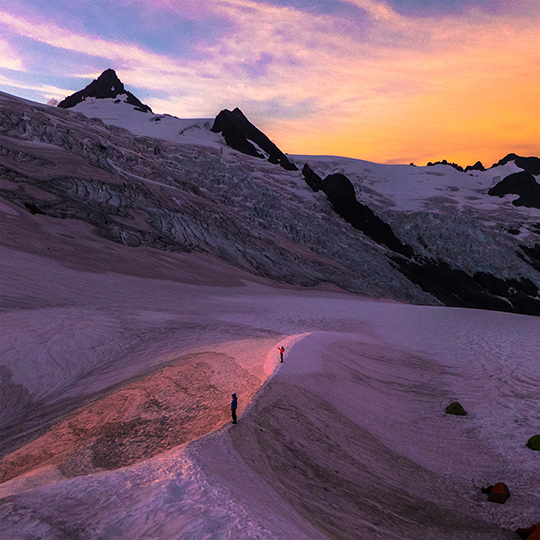 The early start from camp rewarded us with an unreal sunrise and the sun's warmth fueled our rhythm. 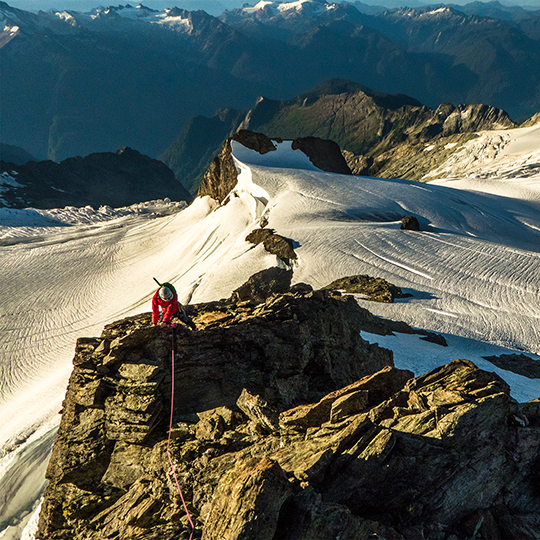 Laura Berridge on the Southeast Arete (5.4-5.6, 800') of Mt. Shuksan's (2783m) summit pyramid. We hit the base of the rock just as the sun poked its head over the horizon casting long shadows and warm light onto the Sulphide Glacier. 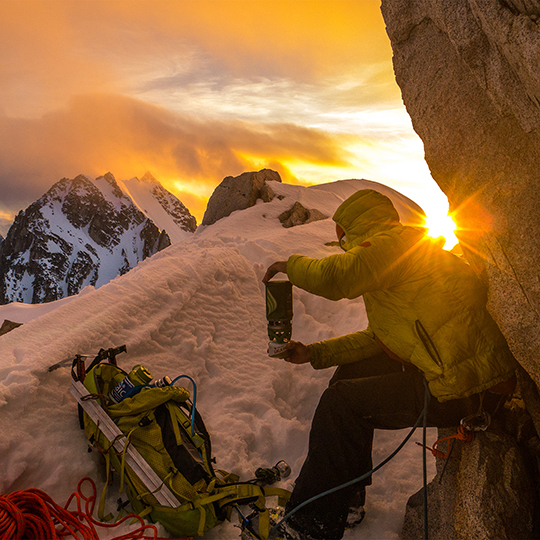 Jake Gaventa takes a moment to brew-up after completing the probable first ascent of Peak 6950', aka Knox Peak, via Rick's Ridge (60+ degree snow, 2,000', Gaventa-Graham-Marshall, 2013) in Alaska's Neacola Mountains. We named the peak and route after two friends who were lost in avalanches. 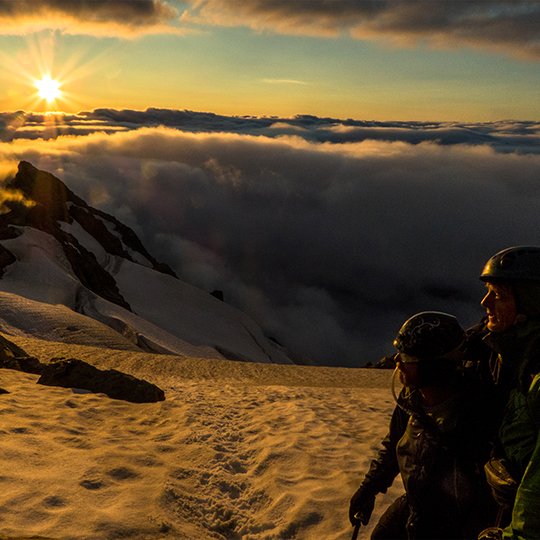 The fatigue of single push climbing—over 23 hours— took its toll, but the golden light kept us moving. 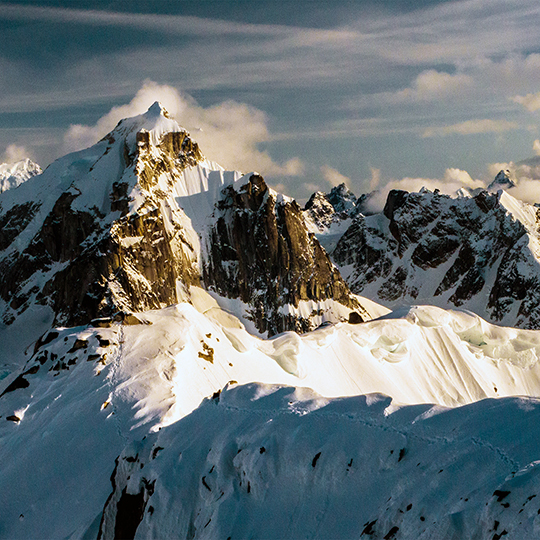 A look back to our footsteps along the corniced summit ridge after completing the probable first ascent of Peak 6950', aka Knox Peak, via Rick's Ridge (60+ degree snow, 2,000', Gaventa-Graham-Marshall, 2013) in Alaska's Neacola Mountains. The Citadel stands tall in the background. See additional images of the Neacola Mountains here. I climbed high on a rocky outcrop above camp to take photos of the sun setting over Puget Sound and Mt. Baker (10,781'), only to realize that the true show was happening behind me over the Sulphide Glacier near Mt. Shuksan (9,131'). James and Vincent Booth, soaked by mist and rain, pause during a brief moment of sun while climbing the Fisher Chimneys (5.4-5.6, 50 degrees, 6,000') to the Southeast Arete on Mt. Shuksan's (2783m) summit pyramid. Wildfire smoke was a constant reminder of the uncharacteristically warm and dry summer of 2015 in the Pacific Northwest. This was a bittersweet moment seen from our bivy on Mt. 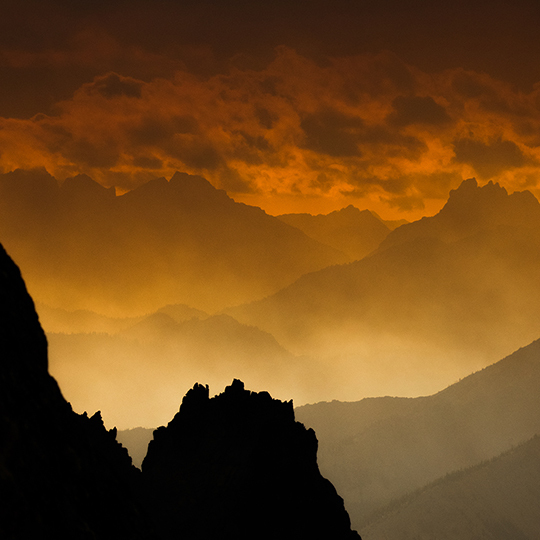 Stuart's (9,415') North Ridge (5.9, 1,200') as the mountains were silhouetted by smoke and the setting sun. To learn more about Christopher Marshall, follow him on Instagram or Facebook.